I just wanted to pop online and let you know I'm ironing my husband's shirts for the first time in a couple of weeks. 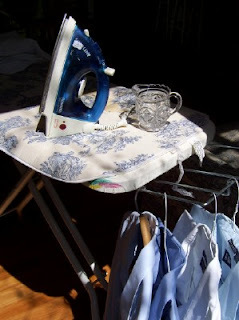 He would never chide me for forgetting, but I snapped to attention when I noticed he was unfolding the ironing board to starch them himself. Everyone falls out of step sometimes, even those of us whose full time job is keeping home. Just remember every day is a fresh start. Whatever job you've been putting off CAN be accomplished! After you've pressed to perfection, don't ruin all that hard work by squishing the shirts together in a closet. Let the steam air a bit first. We haven't found a great place to hang a laundry line in the new house. I've been using our back railing "temporarily" for the last six months! Meredith - i've fallen out of step with a lot of things lately. This pregnancy is really wiping me out. I am getting back in the swing of things (oh so slowly). On a whole different note, my brother is about to ship out to Iraq next month and I remembered your brother was there for awhile too. Is he home safe and sound now? 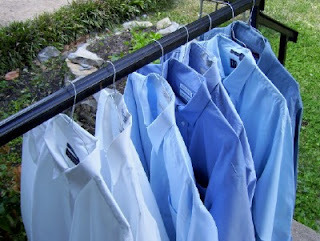 I iron my husband's shirts and hang them in the doorway jam of a rarely used room (so no one will knock them off while they finish airing). Why is it all his expensive thrift store shirts from the top designers need ironing??? Oh well, one day I will re-donate them and keep the cheaper ones instead! Isn't it great that you can find extremely expensive shirts for pennies on the dollar at tag sales and thrift stores? Every time I iron those polo ponies, I have to smile! I love you blog, I have said that before... but I never realized how much I think of the blogs I read as friends (well, the people that write the blogs I read) until yesterday when I was looking over a discounted cookbook rack at an Amish fabric store and spotted a marked down copy of Fix it and Forget it for Diabetics. When I saw the title I thought to myself... wow, Meredith could use that for her husband. nancyr - I use a homemade starch, which you can find here: http://tipnut.com/homemade-lavender-starch-recipe - this is where I found a starch recipe and I love it! I also use a homemade starch--well, it comes in a box in powdered form and I mix it up. I put it in a squirt bottle and liberally douse a shirt before ironing. It seems to get the shirt damper than the aerosol can, plus it's better for the environment.